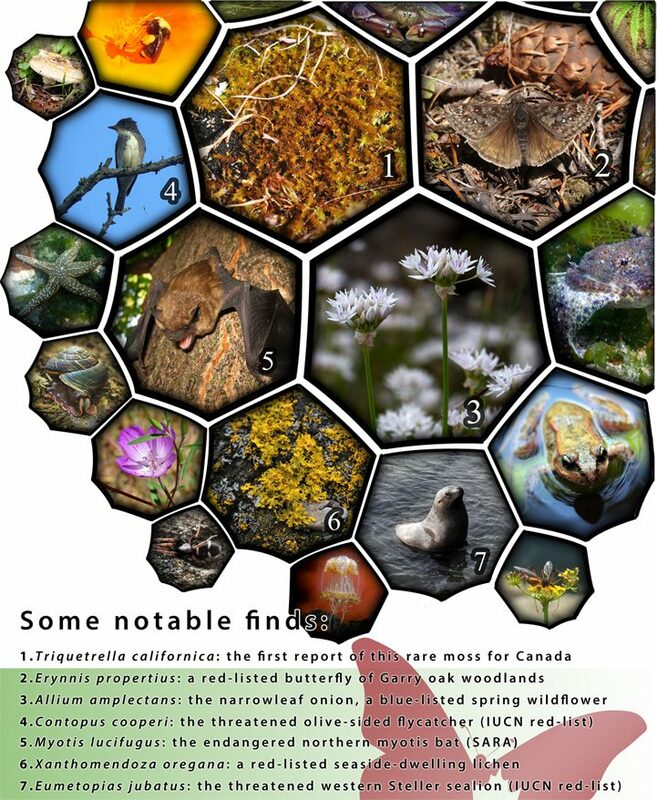 Through the month of May 2017 Galiano Islanders joined regional experts on a mission to document the island biodiversity. Surveys were conducted island-wide, covering a vibrant spectrum of marine, terrestrial and freshwater ecosystems of critical conservation concern within Canada. These efforts culminated with a Bioblitz held on May 27, involving 21 experts and 39 community members. Scroll down for a preliminary list of our findings! Over the course of the month we documented over 800 species—from the heights of the forest canopy to the depths of the Salish Sea. The island life list continues to grow as experts submit their records. And though it may be a while yet before those studying some of the more obscure groups finalize their lists, the results compiled to date are already remarkable. Participating experts included: naturalists Libby and Rick Avis; Henry Choong, curator of invertebrate zoology at the RBCM; botanist Quentin Cronk, UBC; Joel Gibson, curator of entomology at the RBCM; entomologist Scott Gilmore; local ornithologist Michael Hoebel; environmental scientist Tyler Innes; naturalists Harvey and Pam Janszen; bryologists Steve Joya and Olivia Lee from the Beaty Biodiversity Museum; biologists Kristen and James Miskelly; entomologist Diana Percy, UBC; local marine photographer Karolle Wall; and botanist Alexander J. Wright. Additional taxonomic expertise was provided remotely by arachnologist Robb Bennett, botanist Curtis Björk, lichenologist Trevor Goward, and marine naturalist Andy Lamb. Our thanks go out to the many individuals who supported this event, including our sponsors: Crystal Mountain Society, the Galiano Conservancy Association, the Galiano Naturalists, and Gulf Island Kayaking. Amphichroum maculatum rove beetle Beetles ? ? Caloplaca chrysodeta — Lichens ? ? Cameraria gaultheriella leaf blotch miner moth Butterflies & Moths ? ? Cardellina pusilla Wilson's Warbler Birds ? ? Chlorochroa rossiana stink bug True Bugs, Cicadas, Hoppers, Aphids and Allies ? ? Cylindrocopturus furnissi Douglas-fir twig weevil Beetles ? ? Dendroica coronata yellow-rumped warbler Birds native ? Dicerca tenebrosa dark jewel beetle Beetles ? ? Diplolepis polita spiny leaf gall wasp Ants, Bees, Wasps & Sawflies ? ? Dyslobus granicollis broad-nosed weevil Beetles ? ? Eronyxa pallida bark-gnawing beetle Beetles ? ? Erythranthe microphylla small-leaf monkeyflower Vascular Plants ? ? Erythranthe nasuta seep monkeyflower Vascular Plants ? ? Geothlypis tolmiei MacGillivray’s warbler Birds ? ? Graphopsocus cruciatus narrow bark louse Bark Lice ? ? Gyrinus bifarius whirligig beetle Beetles ? ? Homalothecium aureum — Bryophytes ? ? Hypena humuli hop vine moth Butterflies & Moths native ? Idolus columbianus click beetle Beetles ? ? Kleidocerys resedae seed bug True Bugs, Cicadas, Hoppers, Aphids and Allies ? ? Membranipora membranacea kelp lace bryozoan Bryozoans ? ? Otiorhynchus singularis clay-coloured weevil Beetles ? ? Picoides villosus hairy woodpecker Birds native ? Plectrura spinicauda flat-faced longhorn beetle Beetles ? ? Podabrus cavicollis soldier beetle Beetles ? ? Prosternon bombycinum click beetle Beetles ? ? Prothalpia holmbergi false darkling beetle Beetles ? ? Psyllobora vigintimaculata twenty-spotted lady beetle Beetles ? ? Pterostichus algidus woodland ground beetle Beetles ? ? Ricciocarpus natans purple-fringed Riccia Bryophytes ? ? Rosulabryum canariense — Bryophytes ? ? Scaeva pyrastri Holarctic pied hoverfly Flies ? ? Scaphinotus angusticollis snail-eating beetle Beetles ? ? Scleropodium obtusifolium — Bryophytes ? ? Scymnus nebulosus dusky lady beetle Beetles ? ? Selatosomus suckleyi click beetle Beetles ? ? Silis lutea soldier beetle Beetles ? ? Strophosoma melanogrammum broad-nosed weevil Beetles ? ? Synecdoche nemoralis achilid planthopper True Bugs, Cicadas, Hoppers, Aphids and Allies ? ? Syneta albida leaf beetle Beetles ? ? Tetracis cervinaria slant-line moth Butterflies & Moths ? ? Zacotus matthewsii ground beetle Beetles ? ? Arbutus menziesii arbutus Vascular Plants native S4? Castilleja attenuata narrow-leaved owl clover Vascular Plants native S4? Galium trifidum small bedstraw Vascular Plants native S4? Montia fontana blinks Vascular Plants native S4? Trifolium microcephalum small-headed clover Vascular Plants native S4? Trifolium oliganthum few-flowered clover Vascular Plants native S4? Trifolium willdenovii tomcat clover Vascular Plants native S4? Anisocarpus madioides woodland madia Vascular Plants native S5? Myotis evotis long-eared myotis Mammals native S5? Pinus ponderosa Ponderosa pine Vascular Plants native S5? Potamogeton natans floating pondweed Aquatic Plants native S5?